Fresh Water: Women Writing on the Great Lakes is a collection of nonfiction works by women writers. These works focus on the Midwest: living with the five interconnected freshwater seas that we know as the Great Lakes. Contributing to this collection are renowned poets, essayists, and fiction writers, all of whom write about their own creative streams of consciousness, the fresh waters of the Great Lakes, and the region's many rivers: Loraine Anderson, Judith Arcana, Rachel Azima, Mary Blocksma, Gayle Boss, Sharon Dilworth, Beth Ann Fennelly, Linda Nemec Foster, Gail Griffin, Rasma Haidri, Aleta Karstad, Laura Kasischke, Janet Kauffman, Jacqueline Kolosov, Susan Laidlaw, Lisa Lenzo, Linda Loomis, Anna Mills, Stephanie Mills, Judith Minty, Anne-Marie Oomen, Rachael Perry, Susan Power, Donna Seaman, Heather Sellers, Gail Louise Siegel, Sue William Silverman,Claudia Skutar, Annick Smith, Leslie Stainton, Kathleen Stocking, Judith Strasser, Alison Swan, Elizabeth A.Trembley, Jane Urquhart, Diane Wakoski, and Leigh Allison Wilson. 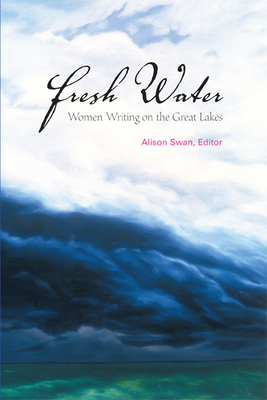 Alison Swan is an award-winning environmental activist whose work, Fresh Water: Women Writing on the Great Lakes, won a 2007 Michigan Notable Book Award. Her poems and essays have appeared in many publications, including two poetry chapbooks, the North American Review, TriQuarterly, and the Michigan Quarterly Review. She teaches at Western Michigan University.